He looked into their eyes, both of them. He shouldn’t have even been talking with the woman at the well because of her race. The woman with the issue of blood shouldn’t have even been near Him because of her uncleanliness. I shouldn’t even be allowed to approach Holy God because of my sin. We are just like them. I am the Samaritan woman hiding from my sin in the heat of the day. My secrets take different forms than 5 former husbands, but I hide them just the same, down deep so that people won’t see. I wonder why He is even speaking to me, so ordinary. Doesn’t He know my faults? He does. And His desire is to heal, to comfort, to uplift. His desire is that I would know the lines under his eyes and the beads of sweat on his forehead and the lilt of his voice just as intimately as she did. My sin leaves me thirsty and I long for living water. I yearn for it and He gives it freely. I am the woman with the issue of blood – persistent sickness in need of a Healer. Except I am a woman with the issue of sin instead, in need of a Savior to wash me clean. I am chasing after Him, reaching toward Him, longing just to touch the hem of His robe. And He is not far off. He turns toward me the way He turned toward her, kneels down, cups my chin in His hand. He has made us well! Hallelujah! He has made us well and He has given us peace. We are healed from our depravity, our iniquity, our wickedness. We are given peace from our struggling, our striving, our hurt. He loves us like that. The sick woman chases after Jesus, after twelve years of no answers. It doesn’t matter what the world says, if they say she is dirty and hopeless. She chases after Him because she believes that He has what she needs, that He can heal her. And He does. She squeezes through the crowd, reaches for His hem, because she knows He is the Savior. And He is. The woman at the well, she runs into the town to tell anyone, everyone what He has done for her. This man knows everything she has ever done and yet still He loves her and desires to set her free. They believe because of her testimony, they race to see for themselves, to hear and see and touch, and they too are saved. We have received this same grace. So might we spend our whole lives like these women – broken, thirsty and in need of Him. Reaching out for Him, no matter the circumstance. Fearlessly hoping in Him regardless of what the world might say about our situation or the extent of our brokenness. Bearing our hearts to Him, no matter the shame of our sin. Running toward Him, no mater the distance. Boldly proclaiming to all the world, “Come and listen! Come and see what He has done for us. He has made us well! He has given us peace!” He loves us like that. Love this!! Thanks so much for reminding me. Beautifully written and authentic. Your age does not reflect your wisdom. Blessings to your family and ministry. Beautiful words, Katie! Thank you. Thank God for the sacrament of reconciliation where the priest in persona Christi gives us penance and absolution. We are forgiven. We are loved. Yes how He loves us! Thanks Katie for sharing the gifts you have been given so freely with all. Your gift of expression through writing always encourages my heart. Your actions demonstrate so beautifully the love of Christ. I first heard about you through a friend of mine who works in Guatemala and he suggested reading your blog. So glad that I did. You are one of my favorite people on the planet. That's a crazy kind of love! Imperceptible really. I'm still learning to trust His love! Thanks for the reminder to look to Him for our reflection and not into the mirror! What a blessing this post is. Life is a little much right now, but I know God's grace abounds in me! Thanks for reminding me with these beautiful words!!! Read all your post, don't comment much, but am praying for you. Praise God our Father, Savior, Healer and Comforter!! Thank you for this post.....it was needed in my life tonight! I pray for you and your mission and I am asking God to give me the means to do more. Pray for me! Amen and Amen! Father, we pray that you make us a people and a bride not defined by our situations or ever changing emotions and desires. Rather, in every circumstance and situation, give us the grace to worship you through the truth of what you have spoken over us. We are your beloved children, set free from our sins and our fears by the blood of your Beloved. Open up our eyes to so completely see you and to be blinded by your beauty and love that we forget ourselves. And fill us up Father, so that we become vessels of love to be poured out to those dry and desperate souls around us. In Jesus Name - Amen! I read your book two years ago, and was in tears constantly. It changed my entire perspective of life. I'm going to school to become an Occupational Therapist. My dream is to do missions eventually. Tonight in particular I am terrified of the future with an extreme lack of faith it God's provision in my life because of how much I mess up and dismiss him. I randomly thought of you and wanted to read one of your prayer that you had written in Kisses from Katie because they were always so much better than the words I could come up with, and then i came upon your blog. Particularly this post, that was posted just yesterday. It is exactly what I needed to be reminded of and I could not be more grateful or in awe of God. Thank you for being so full of him that he bursts from your fingertips as you type, speak, and interact with his children. You are truly a blessing to millions you haven't even met. Thank you, Katie. At church this evening our pastor spoke of fearlessness and boldness in being part of Christ's church. He spoke of the pain that he suffered as a child of not fitting in and the loneliness that goes along with that. But that when he was saved, he now knew that he fit into the family of Christ. For the first time in his life he fit! He also spoke of bringing down or getting out of our walls or wherever we hide ourselves to have an impact for Christ, otherwise it does no good to know him and not to share him with others. I have seemingly been in fear my entire life in one way or another, weather it was how people would see me or just worried about someone pointing me out for something that I said, did, wrote or didn’t understand. So, I have stayed mostly silent. Don’t get me wrong, I grew up in a family of love but I have always kept things in… to myself. The story of boldness you tell here is one that I struggle with, but I desire to be different. In fact just writing this, knowing that many people may read it is not easy. My wife and I have recently finished reading your book and can I honestly say, that I am not the same… I have been changed. Like the women you speak of, I desire to reach out in faith and touch his robe and allow God to heal me, to move me, I desire to hear his voice and even in my extreme discomfort in nearly everything, except behind my own walls, be faithful. I thank Jesus on a daily basis for the example of boldness and God’s love that you share with others. Thank you!! At church this evening our pastor spoke of fearlessness and boldness in being part of Christ's church. He spoke of the pain that he suffered as a child of not fitting in and the loneliness that goes along with that. But that when he was saved, he now knew that he fit into the family of Christ. For the first time in his life he fit! He also spoke of bringing down or getting out from behind our walls or wherever we hide ourselves, to have an impact for Christ, otherwise it does no good to know him and not to share him with others. I have seemingly been in fear my entire life in one way or another, weather it was how people would see me or being worried about someone pointing me out for something that I said, did, wrote or didn’t understand. So, I have stayed mostly silent. Don’t get me wrong, I grew up in a family of love but I have always kept things in… to myself. The story of boldness you tell here is one that I struggle with, but I desire to be different. In fact just writing, knowing many people may read this, is not easy. My wife and I have recently finished reading your book and can I honestly say, that I am not the same… I have been changed. Like the women you speak of I desire to reach out in faith and touch Christ's robe and allow God to heal me, to move me, I desire to hear his voice and even in my extreme discomfort in nearly everything, except behind my own walls, be faithful. I thank Jesus on a daily basis for the example of boldness and God’s love that you share with others. Thank You! At church this evening our pastor spoke of fearlessness and boldness in being part of Christ's church. He spoke of the pain that he suffered as a child of not fitting in and the loneliness that goes along with that. But that when he was saved, he now knew that he fit into the family of Christ. For the first time in his life he fit! He also spoke of bringing down or getting out of our walls or wherever we hide ourselves for protection, to have an impact for Christ, otherwise it does no good to know him and not to share him with others. I have seemingly been in fear my entire life in one way or another, weather it was how people would see me or just worried about someone pointing me out for something that I said, did, wrote or didn’t understand. So, I have stayed mostly silent. Don’t get me wrong, I grew up in a family of love but I have always kept things in… to myself. The story of boldness you tell here is one that I struggle with, but I desire to be different. In fact just writing this, knowing that many people may read it, is not easy. My wife and I have recently finished reading your book and can I honestly say, that I am not the same… I have been changed. Like the women you speak of I desire to reach out in faith and touch his robe and allow God to heal me, to move me, I desire to hear his voice and even in my extreme discomfort in nearly everything, except behind my own walls, be faithful. I thank Jesus on a daily basis for the example of boldness and God’s love that you share with others. Thank you! How do I go about helping serve in your area? I'm a college student, so ready to give up my college life and do what God wanted me to do in the first place, serve him. I am looking for a chance and opportunity! 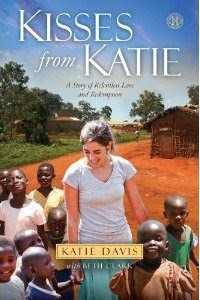 Katie I have always loved your story. I am a college student so ready to give up my college life and do what God called me to do so long ago, I want to help serve. Are there any opportunities? C.S. Lewis said, "Suffering is the chisel God uses to shape our souls." Perhaps in the agony of realizing how in need we are of God and how quickly we can turn in on ourselves, God is shaping us. He is teaching us the virtue of perseverance and creating indestructibly beautiful souls! Katie, I have been truly inspired by your work. More importantly, I am abundantly grateful that you let Jesus work through you daily. It makes a difference, not only to me, but to many, many others. I am a 27 year old living in Columbus, Ohio and ran across your book on cd on a rainy Sunday visit to the library by accident a few years ago. The way you spoke about your adoption of 13 beautiful daughters stopped me in my tracks. There was no question in my heart that Jesus gave you as a gift to share with the world. I have continued to consider your perspectives as I travel on in my own vocation. My prayers are with you as you continue to encounter the chisel that will shape you and those around you into the perfect image of Jesus! Hello Katie, I am a new fan of yours after i met your father on a flight to Nashville two weeks ago. I too have a Katie who is 28 years old and a intensive care nurse working with pediatric cardiac patients. We were comparing "Katie" stories and I think we both feel that our daughters have done more than either of us ever will. No one deserves God's grace more than me and I am humbled to have learned your story and have been sharing it with just about everyone I meet these days. I will be teaching on Matthew 5:14 tomorrow night in a faith-based community center and will be telling your story about how you are letting your light shine! Thank you for your inspiration to your parents generation! Your words speak of truths not all are able to perceive. Wisdom comes with age, but sometimes it is a gift. I don't believe I've commented here before, but I read your book and put it on my Christmas give-away list a couple of years ago, which includes a group of cloistered nuns in London. They loved your story, and read it aloud in the church so they could all "read" it together. They tell me they are still praying for you daily. Hi Katie! I'm young and really want to do overseas mission work someday, but am having a hard time being patient and being obedient to God now. It is so easy to make excuses and say the simple no when God pulls me out of my comfort zone and into His vast ability. You have been such an inspiration and role model and i can relate to many of the emotions that you describe! Thank you so much and if you would, could you say a quick prayer for me? Thank you som much Princess and Daughter of God! May God bless you and shine His face upon you now! I have read your book and want to say how blessed it has been for me. We had been missionaries in a third world country and I have experienced sitting in a room that was called home by a family that consisted of one bed and a pot for a toilet. We left because of unrest..and many physical calamities that happened to our family.But your wisdom and experiences has helped me to look on to serving again one day, and prayerfully will help us to focus on Christ in a more healthier way. Not the American thinking that something wonderful will happen when serving all the time.. we have to trust what God is doing even when it seems despairing. thank you. Katie I think you are super cool and i love your book. So much so that when we were asked to pick a biography/autobiography for our sophomore english class, your book was the first to pop into mind! You have really inspired me and I think i want to do something like you after high school. I spend all of my free time looking at different programs and things for when i graduate haha. Anyway, you and your family are in our prayers! Truly inspiring writing. I'm tearing up. God is good. I am not. I need Jesus.